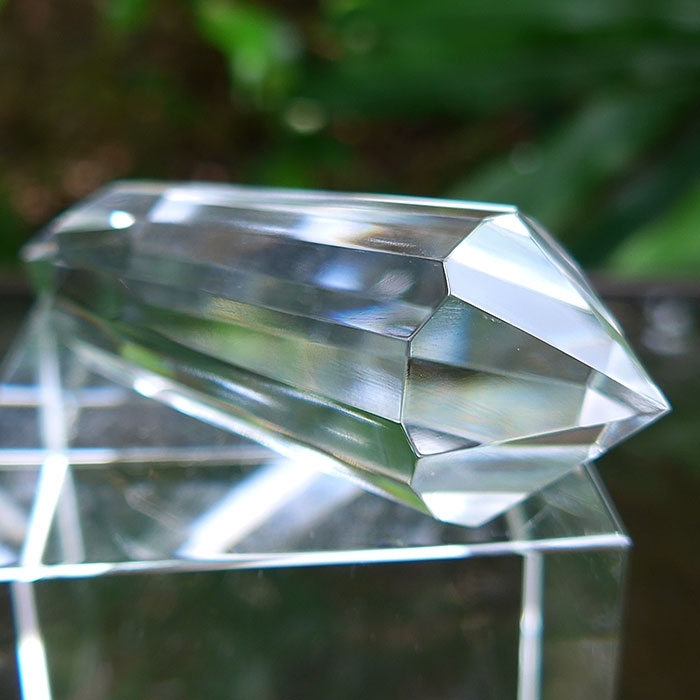 Dimensions (HxWxD): 3.25" x 1" x .75"
This Bright Water Clear 14 Sided Vogel Wand, created by Brazilian Master-cutter and crystal healer Ray Pinto, is 3.25 inches long and weighs 2.4 ounces, or 68 grams. This water-clear Vogel wand has a very comfortable fit in the hand for a lightworker or meditator. It has a very nice feel to it, well-proportioned, slim, and tapering to a definitive point. It is water clear throughout and comes with a free pouch for safekeeping. This Master Cut Vogel Wand was cut by Brazilian Crystal Cutter and Healer Ray Pinto, and is extraordinary in every way. We got this amazing new Vogel Wand from Ray at the 2019 Tucson Gem & Mineral Show. You can see the beautiful scalloped edges on the termination tips defining the facets on the shaft, indicative of the quality of the loving craftsmanship Ray lavished on this wand. 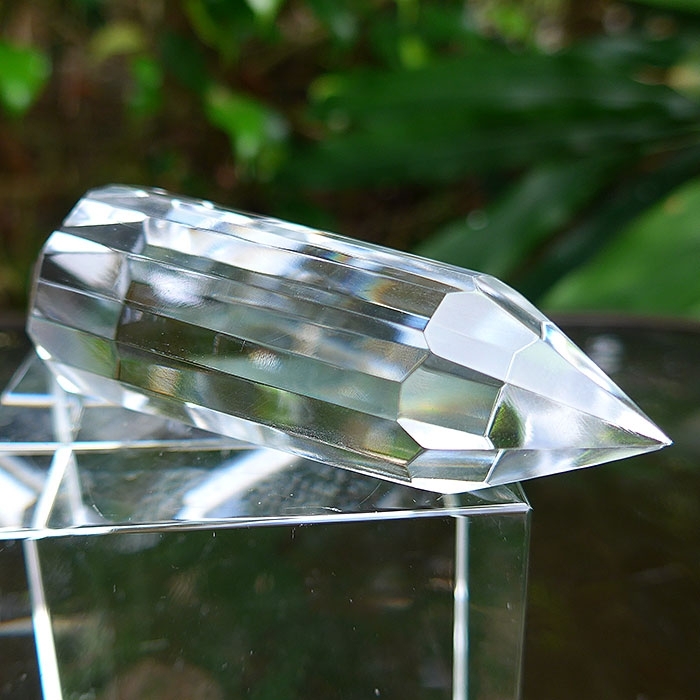 This precision light instrument, with a unique cut based upon the specifications of legendary scientist and crystal healer Marcel Vogel, is a powerful subtle energy tool, and can be used for many kinds of healing work as well as for meditation. Energy and crystal healers prize Vogel cut quartz crystals to this day. The art of cutting crystals for use in healing requires extensive knowledge of the high art of jewel-cutting, an intuitive feel for the subtle energies involved, and an awareness of the needs of the energy healer who will be using the wand. Faceted crystal wands claiming to be Vogel type crystals vary widely in quality, craftsmanship, and price. The most important thing to remember in working with faceted crystals for healing is that the purpose of the faceting should be to amplify and transmit an increasingly coherent stream of energy to a subject. 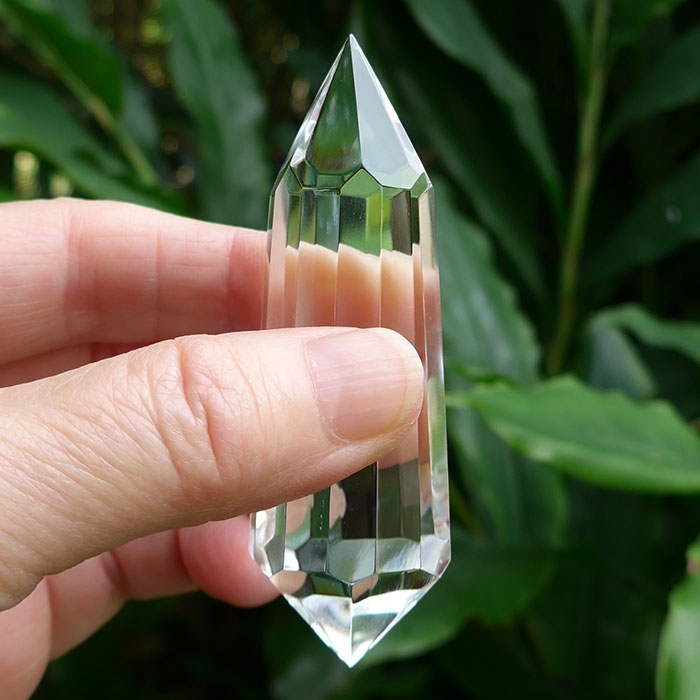 Some hexagonal quartz crystal wands occur naturally with six more or less equilateral sides and more or less equal triangular termination facets. Energy healers discovered that these six sided wands amplifed the energy being transmitted by the wand when the termination facets on the female end created a more obtuse angle and when the termination facets on the male end created a more acute angle. In a naturally formed quartz crystal of somewhat irregular shape and symmetry, the energy within the crystal tends to move through the crystal in a less directed way than the Vogel style cuts. 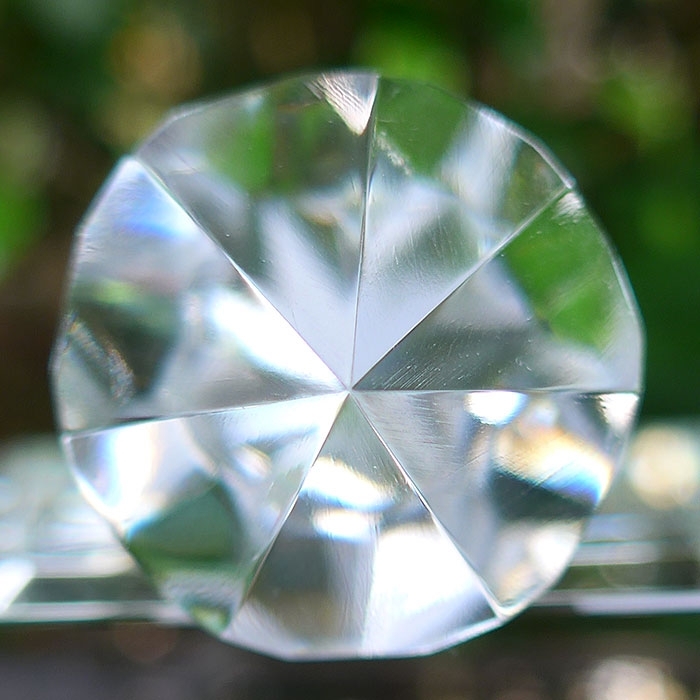 But when a crystal had a very definite symmetry, especially the hexagonal symmetry, then the energy gathers in the larger, receptive end of the crystal, and if directed by a knowledgeable human hand, travels in a series of tighter and tighter concentric circles around the interior of the crystal, and down into the tip of the male end of the crystal, where it would be emitted as a much more coherent stream of energy. Energy healers also discovered that when the sharp male tip of the healing wand is congruent with the C-axis of the crystal, exactly centered within the circle formed when you look head-on at the male end of the crystal, this made the energetic flow stronger and more coherent. When the sharp tip on the female end of the crystal, where the six termination facets meet, is congruent with the C-axis of the crystal, exactly centered within the circle formed when you look head-on at the female end of the crystal, this made the energetic flow stronger and more coherent. 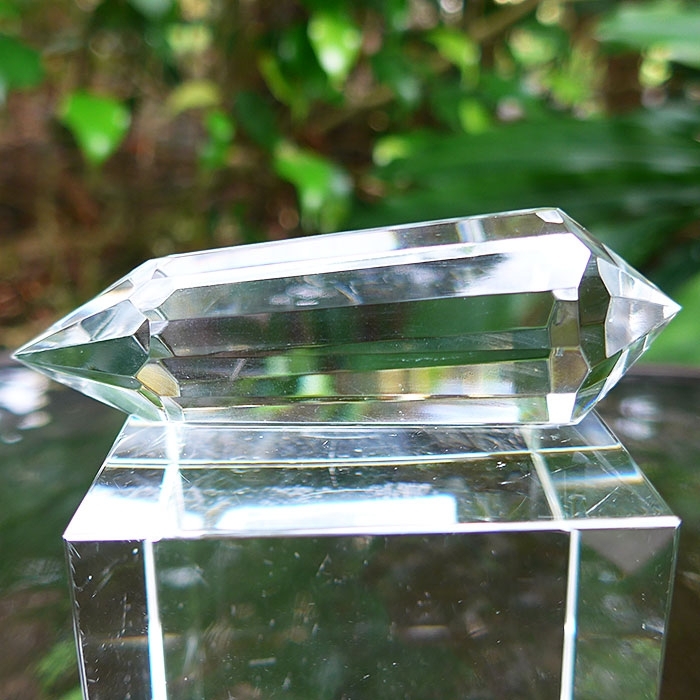 Total symmetry created the crystal healer's version of the laser beam. The best six-sided natural healing wands with well-centered male and female terminations, had a female termination with an angle of 51 degrees, 51 minutes and 51 seconds, equal to the angle of the Great Pyramid of Giza. Marcel Vogel's healing wands are refined artistic versions of natural healing wands. Good Vogel wands should have precisely equal facets. The male and female terminations should be sharp, and the male should be more acute than the female. The female termination should be 51 degrees, 51 minutes and 51 seconds. The male and female termination tips should be exactly centered in the circle you cee when you look head-on at the crystal from either end. As you can see from this brief, simplified description of the intricacies of Marcel Vogel's designs, it is extremely difficult to create Vogel wands. I have seen many "Vogel" wands that do not meet the minimum specifications for a Vogel wand as described above. In addition, the number of facets, the intricacy of the design, the mastery of the wand-cutter, his credentials as an energy healer, the quality of the materials used, and other factors, all contribute to the difficulty of producing Vogel wands. The large, female end of each of Ray Pinto's Master Cut Vogel wands is cut precisely to the interior angle of 51 degrees, 51 minutes and 51 seconds, the same angle as the Great Pyramid of Giza. The C-Axis is precisely defined, all the flat facets are equal in size, and the termination tips are accurately centered and aligned exactly with the C-Axis running through the center of the shaft. This is your guarantee of authenticity. Universal Life Force Energy (also called prana or chi) enters the female end of the wand, spirals down the body of the wand, and is amplifed every time it encounters a facet. The super-charged energy stream coalesces at the male end of the wand, and is emitted as a highly coherent laser-like beam for use in meditation, vibrational healing and subtle communications. 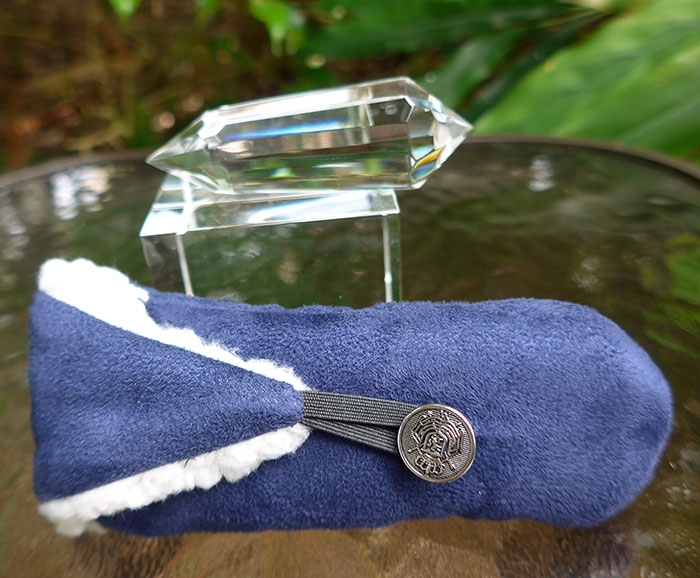 This wand comes with its own FREE handmade pouch constructed of 100% polyester fleece and micro bonded suede that has the look and feel of real sheepskin. They are designed for a snug fit and come with extra padding to protect delicate tips and points. This is a representative picture of one of our Vogel pouches. The pouch for this lovely wand is black and fits like a glove. To learn more about Marcel Vogel and his techniques for crystal healing, read the first several chapters of his never-before-published autobiography, edited by Curtis Lang, which is in our Vogel Archives. You'll find Marcel Vogel's instructions for using crystals for healing and meditation in the book along with a lot of other very important information for all metaphysical rockhounds. Weight above is shipping weight. Net weight of Vogel cut wand is 68 grams or 2.4 ounces.